The Waikiki Aquarium's "Aquarium After Dark" programs provides an introduction to night reef dwellers. Reef walkers carry flashlights and plexiglass "look boxes." The Waikiki Aquarium offers interactive programs for toddlers, a chance to spend the night with the sea jellies, explore the reef at night and hike the Kaena Point coastline. Members receive discounts. Call 440-9007 or e-mail roney@waquarium.org for information or to register. Small Fry: For 1- to 3-year-olds and their parents. Five weekly sessions include crafts, song, play and exploration of the exhibits. Two sessions: 8:30 to 10 a.m. or 10:30 a.m. to noon, Wednesdays, Jan. 11 to Feb. 8. The program repeats Wednesdays, Feb. 15 to March 15. Cost is $80 for adult and child. Exploring the Reef at Night: For children age 5 and up, accompanied by an adult. Wade in the water and learn about coral reef natural history, conservation and safety. Cost is $12 for adults, $10 for children. Sessions are 6:30 to 9 p.m. Jan. 12 and Feb. 10; 6 to 8:30 p.m. Jan. 27 and Feb. 24. Home for a Hermit Crab: For children ages 4 to 6 and their parents. Storytelling, art and up-close encounters with the creatures; 3 to 4:30 p.m. Jan. 17. Cost is $16 for a parent/child team. Fish School: For families with children ages 6 and older. An introduction to common reef fish around Oahu. Includes after-hours tour, 4 to 6 p.m. Jan. 17. Cost is $10 for adults, $8 for children. Kaena Point Coastal Hike: For ages 16 and older. Five-mile nature walk along the shoreline, 4 to 6 p.m. Jan. 17. Participants must provide their own transportation. Cost is $10. 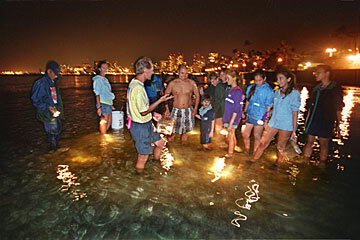 Seaduction, an Evening of Romance at the Waikiki Aquarium: Adults only. An entertaining look at the mysteries of synchronous spawning and the seductive dance of the sea dragons. Accompanied by champagne and gourmet food; Feb. 14. Call the Development Office, 923-9741, option 3. Sea Jelly Overnight: For children at least 5 years old accompanied by an adult. Includes behind-the-scenes tour and visit to the jelly house, crafts and jelly lab; March 3. Evening snack and continental breakfast provided. Cost is $30 for adults, $25 for children. Aquarium After Dark: For children at least 5 years old accompanied by an adult. After-dark flashlight tour of exhibits shows how reefs change with darkness; 7 to 9 p.m. March 14 and 6 to 8 p.m. March 30. Cost is $10 for adults, $7 for children. Ohia Productions offers drama education classes for children beginning Jan. 14 at Windward Community College. Classes will run Saturdays through March 18. Register at the college's Vocational and Community Education office or call 235-7433. Keiki Creative Drama: For ages 6 to 8. Teaches the arts, confidence and self-esteem through the application of theater skills to everyday situations; 9 to 9:45 a.m.
Voice for Older Children: For singers ages 8 to 12. Teaches breathing, placement, relaxation, projection, diction and caring for the voice; 10 to 11 a.m.
Creative Drama for Older Children: For ages 8 to 12. Covers monologue, scene work, character development and an introduction to technical aspects of theater; 11:15 a.m. to 12:15 p.m. The 57th annual Narcissus Festival kicks off Jan. 14 with the Narcissus Queen pageant at the Blaisdell Concert Hall. Contestants ages 19 to 26 will compete for the crown, having prepared through lessons on Chinese culture, and will be evaluated on speech, talent and beauty. The pageant begins at 6:30 p.m. Tickets are $25 to $30, available at the Blaisdell box office. The new queen's coronation ball will be held at 5 p.m. Jan. 21 at the Hilton Hawaiian Village. This year's theme is "A Tribute to the Past" and includes performances by past Narcissus Queens. Cost is $60, which includes a seven-course Chinese dinner. Tables are available for $575 and $675. Call 533-3181 for information, reservations and tickets. James Jacobson, author of "How to Meditate with Your Dog" (Maui Media, 2005, $16.95) speaks on the benefits of meditation at 2 p.m. Saturday at Borders Books & Music, Kahului, Maui. Jacobson, president of Maui Media, has taught classes in Washington, D.C., Denver and Hawaii, encouraging students to elevate their consciousness "by leveraging the love they already feel for their pets," as his biography explains. His book incorporates what he has learned from his own dog, a Maltese named Maui. For information on the book, visit the Web site www.dogmeditation.com. Oceanic Time Warner Cable has launched Jewelry Television on digital channel 102. One of the fastest-growing home-shopping networks, Jewelry Television is the only network to focus exclusively on the sale of fine jewelry and gemstones. Formerly known as America's Collectibles Network, Jewelry Television emerged in 1993 and is currently seen in more than 65 million homes nationwide. Jewelry Television will be available to Oceanic digital cable subscribers throughout Hawaii, except Kohala, Hana, Lanai and Molokai. Neiman Marcus has launched another skin-care line, this one employing Asia's indigenous botanicals. Amore Pacific is the first new skin-care line to be introduced by the luxury retailer in several years. Ingredients used in the Seoul-based skin-care line include red ginseng, bamboo sap and green tea in its Time Response Collection -- created as an antioxidant, age-defying treatment. The price is steep for youth in a jar. A jar of Time Response Eye Cream is $250. Skin Renewal Creme and Time Response Ampoules are more.